I beg to differ in one important respect: this regime is not a long-running reality show, but a long-running jury trial. “The Apprentice” was a reality show. “Project Runway,” “The Bachelor,” “RuPaul’s Drag Race” are all reality shows. They’re pure entertainment, fluff, distractions. There’s nothing at stake for 99.9% of us Americans. The only people who are affected by the outcomes of these shows are the contestants themselves. As far as our lives are concerned, it doesn’t matter who wins or who loses. It’s just another television show. Although the Trump presidency so far has had certain similarities to a reality show, it makes more sense to see it as an actual (as opposed to a fictional) T.V. trial that the entire country is watching unfold live on prime time television. The most famous such trial of recent memory is, of course, the O.J. Simpson trial, which made for some of the most compelling television drama of the 20th century. That trial was not pure entertainment (although entertaining, it was): it was a real trial with a real jury. Two innocent people had been brutally murdered. A celebrity defendant was trying desperately to stay out of jail. There was a lot more at stake than where Biggie and Tupac were. In more ways than one, Trump’s presidency, and the media coverage of it, has turned into a long-running jury trial. The evidence is presented almost every day, both on television and social media, and in the newspapers. There are attorneys for both the defendant, Trump, and for the prosecution, such as Adam Schiff and Kamala Harris. And there is a jury: Us, the American people. We’re all collectively sitting in on this trial. We collectively consider every new bit of fresh evidence. And, as the trial wends its way toward a finale, we have to decide whether the defendant is guilty or innocent. More and more of us are concluding that he’s guilty. Guilty as hell. 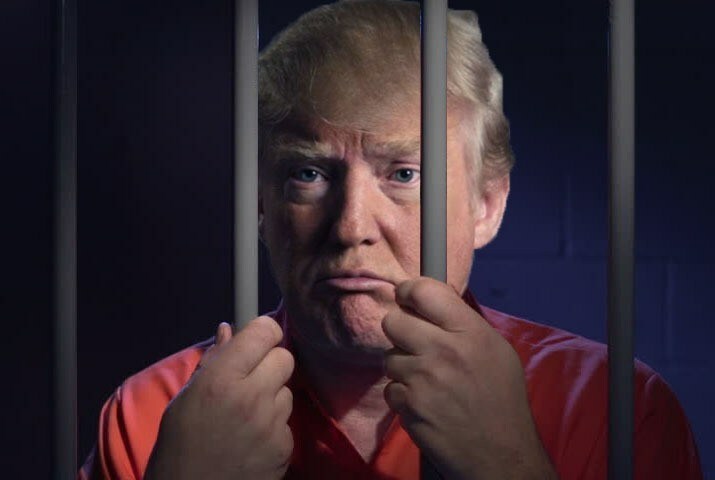 We may not yet know the exact nature of his crimes, but sensible people know that he did commit crimes, for which he must be punished. Trump may once have calculated that by prolonging this trial—by stalling and obfuscating—he would win, when we all got bored with it. He could not have made a greater mistake. Nobody is bored by this. On the contrary, it’s the biggest show in the country. The longer it goes on, the more his ratings tank, and the more the American people—the jury—we–believe that “he did it.” And the more we’re willing to consider impeachment as the punishment (and possibly a criminal indictment, if not while he’s in office, then as soon as he’s thrown out). And so, another week of the trial of Donald J. Trump grinds to an end. It’s been another bad one for him, very bad: the Woodward book, the “anonymous” op-ed piece in the New York Times, Kavanaugh’s sinking poll numbers and embarrassing evasions during his Senate testimony. As we, the jury, get on with our weekend, we can’t help but wonder what the diehard Trump enablers in the Congress—the Ryans, McConnells, Nuneses. Grahams and Hatches—are going to say when their president goes down in utter disgrace. Will they apologize to us, for having lied to us about Trump’s fitness to be president? Will there be terse “no comments”? Journalists will not let these Republicans off the hook, not now, not ever. The old question, “What did the president know, and when did he know it?” is going to be replaced with, “Senator/Congressman, why did you support Trump for so long, even when you knew he was dangerous, and probably criminal?” Good luck trying to dodge that one. Have a wonderful, safe weekend! See you Monday.